by Fisher Coan, 2012, University of North Carolina at Chapel Hill. Songwriter, guitarist, session musician, producer, and indie-rock icon, Mitch Easter was born Mitchell Blake Easter in Winston-Salem in Forsyth County on November 15, 1954. He is best known as a producer for his work with the groundbreaking indie-rock band, R.E.M., producing their first single, "Radio Free Europe," debut EP Chronic Town, and critically acclaimed debut full length album, Murmur. In addition to his production work with R.E.M., Easter's role as frontman and principal songwriter for the band Let's Active placed him at the forefront of the jangle pop movement during the early and mid –1980s. Mitch Easter, like many aspiring rock 'n' roll musicians growing up in the 1960s, got his start playing in garage bands. He met many of his early band mates in elementary school during his childhood years in Winston-Salem. Easter's early garage bands were largely inspired by the British invasion bands of the early to mid 1960s. The Beatles were naturally a huge influence on Easter at the time, but so were the more bubblegum pop bands like The Ventures and The Monkees. As he puts it: "The Monkees were a really big deal for me because I could imagine learning their songs. The Beatles' songs just seemed impossible. …The Monkees' songs were really good songs but somehow they came across as a little less sophisticated and a little bit more friendly to a kid. Some of the first stuff I learned to play on guitar was by The Monkees and also The Ventures." Easter's early garage bands performed at school dances, battle of the bands contests, church sponsored "coffee houses," and the few music clubs in the area during his teenage and high school years. He had a band called Sacred Irony around 1968-1969 who played at the Love Valley Rock Festival and opened for and backed singer Bobby Sherman at a Winston-Salem show. In 1970, at the age of 15, Easter joined the band Rittenhouse Square which included friends Chris Stamey, Peter Holsapple, and Bobby Locke. Membership in the band changed frequently. The group released an independent album in 1972 but was forced to break up in 1973, after its various members went off to college. The next three years were a period of flux and transition for Easter. In the fall of 1973 he headed off to college at the University of North Carolina at Chapel Hill, a college town with an independent music scene just beginning to take shape. There, Easter met many other young musicians like himself, who played in garage bands in junior high and high school. One of them was Don Dixon, a recent UNC-CH graduate, who had formed a band called Arrogance a few years earlier. Arrogance was one of the very first "indie rock" bands to come out of Chapel Hill. With a reputation for being a great live band that would regularly blow other acts off the stage, the group had made quite a name for itself by the time Easter arrived to attend school. Although Easter was never officially involved with Arrogance, he would often get together and "jam" with Dixon and the other up-and-coming musicians living in and around Chapel Hill. Occasionally a "band" would form out of these loose and informal jam sessions. These groups would get together and record a couple of original tracks but mostly just played covers, maybe performing a few gigs at parties and/or local bars and clubs, and almost never releasing their songs officially in the form of 45" singles or EPs. They also frequently changed names and personnel, and were all short-lived. Then in the summer of 1976, just before his senior year of college, Easter reunited with his old friend Chris Stamey, joining Stamey's band Sneakers. He met up with Stamey and former Rittenhouse Square drummer, Will Rigby, in New York that summer. The group played several shows to rave reviews around New York City, including the famed underground rock club, Max's Kansas City. The band's sound was highly informed by the reflective power pop of Big Star, a style of pop rock influenced by the British Invasion bands and pre-psychedelic American pop rock of the 1960s like The Beatles, The Rolling Stones, The Kinks, The Byrds, and The Beach Boys. Given the musical background of Easter and Stamey, the power pop sound proved to be a good fit. While in New York, Easter saw the emerging new wave and punk rock movement as it was starting to emerge at rock clubs around the city like Max's and CBGB's. Getting a chance to see groundbreaking bands and artists like The Talking Heads, Television, The Ramones, Patti Smith, and Blondie from a close-up vantage point was an eye-opening experience for Easter. He saw how bands were able to draw in large, enthusiastic crowds and create a buzz on their own without having to cater to the glitzy pop sensibilities of mainstream radio at the time- which he found to be very unappealing and unexciting. Watching these new bandsgot him excited, for Easter, punk rock represented the true beginnings of the "Do-it-Yourself," or "DIY" movement in writing, recording, and performing music. Although he appreciated the attitude and the fervor, Easter could not totally get into the abrasive side of punk rock. However, seeing these bands record and distribute music to their fans on their own terms planted the idea in Easter's head to start a recording studio. In 1977, Easter graduated from college, and although he continued to record and perform with Stamey and Sneakers, he did not join them in New York until a year later in 1978. The band had already released an EP recorded without Easter by the time he arrived in New York. With his arrival, Sneakers set out to record their first full length LP, In the Red, released in 1978. By the time recording was set to begin on In the Red, most of the band had parted ways, thus the project was largely a Stamey-Easter affair, with Easter contributing guitar, bass, drum, and vocal tracks. The group added a few musicians for live shows and embarked on a limited tour which included a show at the legendary CBGB's rock club. Sneakers folded shortly after its brief tour and Stamey and Easter parted ways. Chris Stamey formed a new band, The dB's, and Easter started The H-Bombs with Peter Holsapple, Robert Keely (Sneakers' bassist) and Chris Chamis in 1977-1978. He also set his sights on starting up his first recording studio. Initially, he planned on starting the studio in New York and was close to securing a space and purchasing the equipment but backed out when the financial commitment became too great. This turn of events forced Easter to move back to North Carolina in 1980. In July of that year he started Drive-In Studio in his parents' garage on the outskirts of Winston-Salem. The decision to start up a recording studio in North Carolina instead of New York City would prove to be a timely endeavor for Easter. By 1980 the new wave scene was in full swing and the new sound was slowly taking over college radio. This was especially true in college towns around the southern United States, like Chapel Hill and Athens, Georgia, where a lot of these bands were emerging. Most of these up-and-coming bands were ready to record their own songs but lacked the money necessary to book studio time at most professional studios. Easter's Drive-In Studio offered a unique blend of professional caliber recording capability combined with Easter's own production expertise at a discount price that was immediately attractive to these struggling indie bands. One such band was a group from Athens that went by the name R.E.M. Mitch Easter had heard of R.E.M. but at the time had not heard their music and wasn't really sure what the band sounded like. The two parties were introduced through mutual friends in the college rock scene. Easter would later describe his first impression of R.E.M. after seeing a poster of the group. "You know it's funny, I really didn't know anything about them. I saw posters for them everywhere and there was something about the poster that made me think they were going to be like Ultravox or something electronic like that. They were anything but electronic." In fact Easter was surprised at how traditional R.E.M. was in their make-up and their approach to making music, describing them as "these four groovy guys with their four groovy songs." They reminded him of the sixties bands that he had grown up listening to as well as some of the bands he had previously played in. Easter meshed well with R.E.M. and they seemed to appreciate his approach to making music and recording. He later recounted that "[t]hey came up the night before the session and stayed at my house and we all hung out and played records." Easter produced R.E.M. 's first single "Radio Free Europe," released on short-lived Hib-Tone Records in 1981. That same year Easter started his own band, Let's Active, with his then girlfriend, Faye Hunter, on bass, and Chapel Hill native Sara Romweber on drums. Let's Active took its name from a nonsensical English phrase on a Japanese T-shirt popular at the time. Often classified as jangle-pop, for the band's mix of the chiming, or "jangly," guitar sound of 1960s pop with more current power pop song structures, Let's Active began touring with R.E.M shortly after the release of "Radio Free Europe." The following year, in 1982, Easter produced R.E.M. 's debut EP, Chronic Town. Inspired by Krautrock band, Kraftwerk, Easter tried various sonic experiments, recording tape loops and singer Michael Stipe singing outdoors. The result was a lo-fi recording that evoked the music of the late sixties while still sounding new and unique. Initially set to be released on an indie label co-owned by the band's manager called Dasht Hopes, the Chronic Town EP soon caught the interest of I.R.S. Records. I.R.S. had distribution through A&M Records and the capability to expose R.E.M. to a much larger audience. Chronic Town was released by I.R.S. in the summer of 1982, and R.E.M. set out with Easter's band, Let's Active, on a tour to support the EP and promote the upcoming full-length release. In 1983, Easter's own band was signed by I.R.S. and he went to work with R.E.M. on their first full-length album. That year Let's Active released their debut EP, Afoot, and Easter produced R.E.M. 's debut LP, Murmur, with college friend Don Dixon, to rave reviews from pop music critics. Murmur was named by Rolling Stone magazine as the best album of 1983, beating out Michael Jackson's Thriller, The Police's Synchronicity, and U2's War. In 2003, Rolling Stone placed the album at 92 on its list of the 500 greatest albums of all time. 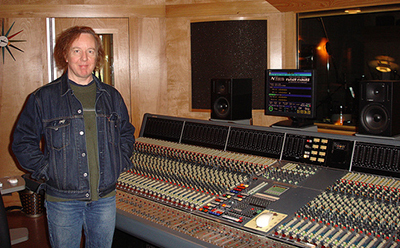 The production of Murmur would be the benchmark of Mitch Easter's career in the music industry. Though he also produced R.E.M. 's second release for I.R.S., 1984's Reckoning, it was his work on Murmur that solidified his reputation as one of the foremost indie/pop rock producers of the last thirty years. Also in 1984, Let's Active released its own full length LP on I.R.S., Cypress, which was a critical darling upon its release but did not receive nearly the amount of attention or industry praise as the R.E.M. releases. Still, Let's Active was helped out tremendously by its association with R.E.M., and the band continued to open for R.E.M. at sold out shows through 1984. They also put out two more albums on I.R.S., 1986's Big Plans for Everybody and 1988's Every Dog Has His Day. Though Easter never again worked with R.E.M. in an official capacity, aside from sitting in with the band for a few live performances, the reputation he earned working with them as a producer provided him with steady work as a producer and a session musician throughout his career. Although his own band never made a huge commercial splash, Easter's constant presence in the studio afforded him the ability to continue to write and record his own music. After his work with R.E.M., Easter continued to produce albums by other indie rock bands, many of which were also college radio favorites. His credits included Pylon, The Bongos, Marshall Crenshaw, and Game Theory, In the nineties Easter's production credits extended to notable artists such as Ken Stringfellow of The Posies, Pavement, and Helium. As a session player, he contributed guitar tracks to notable albums such as Suzanne Vega's 1987 Solitude Standing and Alejandro Escovdeo's 2001, A Man Under the Influence. The 2000's would see Easter playing guitar and producing for the band Shalini, a group fronted by his former wife, Shalini Chatterjee. In 1999, Easter moved out of Drive-In Studios after construction on his new, fully outfitted studio was completed. He has owned and operated The Fidelitorium in Kernersville, N.C. since 1999. In 2007, Mitch Easter released Dynamico under his own name, his first album in nearly 18 years. He played almost every instrument on every track and recorded all his own vocals for the album, releasing it on his own label, Electric Devil. "100 Best Albums of the Eighties, #8 R.E.M., Murmur." Rolling Stone. Last Modified 2012. http://www.rollingstone.com/music/lists/100-best-albums-of-the-eighties-20110418/r-e-m-murmur-19691231 (accessed July 12, 2012). Hib-Tone Records, Inc. Last Modified 2012. http://www.reverbnation.com/label/hibtonerecordsinc (accessed July 12, 2012). I.R.S. International Record Syndicate, Inc. Last Modified 2012. http://irsrecords.net/ (accessed July 12, 2012). Mitch Easter.com, Mitch Easter. Last Modified 2012. http://www.mitcheaster.com/ (accessed July 12, 2012). Rate Your Music . com, Rittenhouse Square. Last Modified 2012. http://rateyourmusic.com/artist/rittenhouse_square (accessed July 12, 2012). R.E.M. HQ, R.E.M. Last Modified 2012. http://remhq.com/index.php (accessed July 12, 2012). Shalini, The Surface and the Shine. Last Modified 2012.http://www.allmusic.com/album/the-surface-and-the-shine-mw0000751596 (accessed July 13, 2012). The db's online.net, the db's. Last Modified 2012. http://www.thedbsonline.net/ (accessed July 12, 2012). "Between Love and Like," Courtesy of Erica Bruce, "Thieves Steal Eight Guitars from Mitch Easter's Fidelitorium Recordings/Drive – In Studio" August 12, 2011. Located at http://betweenloveandlike.blogspot.com/2011/08/thieves-steal-eight-guitars-from-mitch.html. (accessed April 14, 2014). Flasshe "Fidelitorium Mixing Console." March 26, 2006. Available from: Flickr Commons, http://www.flickr.com/photos/flasshe/119078657/ (accessed December 17, 2012). angrylambie1. "Mitch Easter, Michael Quercio, Scott Miller 1986." January 5, 2007. Available from: Flickr Commons, http://www.flickr.com/photos/angrylambie/346811989/ (accessed December 14, 2012).